Once I put together the salad part of this recipe, I experimented with quite a few new dressings to really make it shine. My extended family served as official taste testers over several Sunday dinners. I offered two bowls, each with different dressings so everyone could offer his or her opinion. They had to keep their portions separate so they didn’t confuse the two options. They are very good sports! The dressing that consistently came out on top was my old recipe for Maple Dijon Vinaigrette. If I had simply chosen that dressing from the start, which did occur to me, I would have saved a lot of time! (My brother did happily take home any leftovers.) The dressing is a recipe that I created a couple of years ago after my dad turned me on to a certain restaurant salad. He raved about it often enough that I had to try…and then I had to have it often…which led to the dressing that has proved to be more versatile and popular than I ever imagined. Yet it is so basic and simple. This salad has become a regular here for many reasons. The flavors and textures are hearty and satisfying. The dressing is one that can be kept in the fridge for weeks, so the salad can be pulled together quickly. The salad is packed with protein and anti-oxidants. The ingredients are available locally year round, as kale is a cold tolerant vegetable that can be grown in greenhouses though the winter here (and in many other colder regions). A bowlful is substantial enough to be the whole meal, though the men in my family do prefer it alongside chicken, salmon, or steak. Lastly, the leftovers are great as kale does not wilt like many greens do when stored overnight in the fridge. Baby kale, which is available in the produce department of many grocery stores, makes easy work of this salad and is more tender than its full-grown counterpart. Regular kale may be used, simply remove the tough stems before chopping the leaves. Feel free to add a chopped apple or pear to this salad for another fruity addition. Yields 4 large servings; more if eaten as a side dish. In a small bowl or jar, combine the olive oil, maple syrup, vinegar, Dijon, salt and pepper. Mix well. The dressing can be made in advance and will keep several weeks in the refrigerator. Bring to room temperature, and shake well before using. 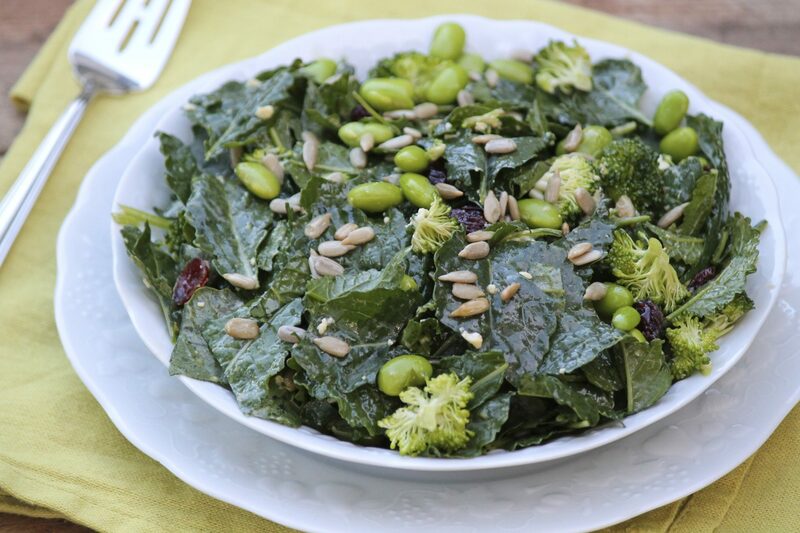 In a large bowl, combine the kale, edamame, broccoli, goat cheese, dried cranberries, nuts, and seeds. Drizzle with the vinaigrette and toss to coat. Pass with any leftover vinaigrette or store for future use. 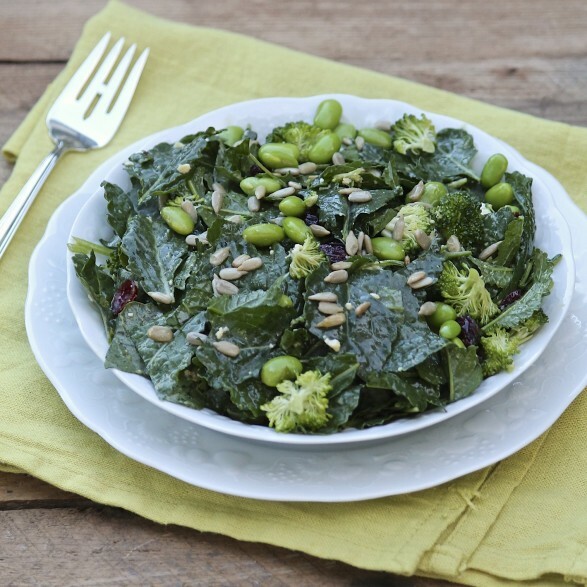 Because kale is sturdier than most lettuces, this salad may be prepped in advance and stored in the refrigerator for several hours before serving. If using full grown curly kale (which is not as tender as mature Lacinato or Dinosaur kale), I would even recommend preparing in advance. This will allow the leaves to soften a bit. Any leftovers will taste great! 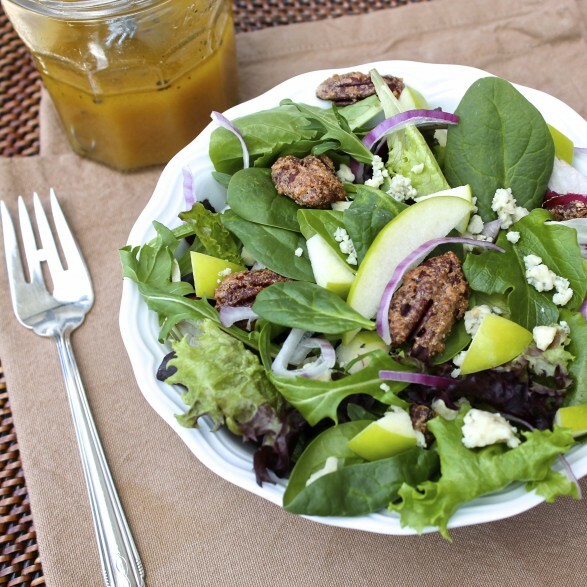 Another family favorite that uses this vinaigrette is Apple Pecan Spring Greens. 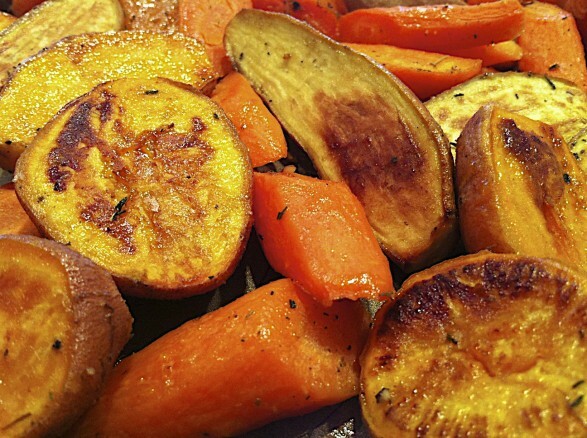 For a savory side dish using the same dressing, you may enjoy Maple Dijon Roasted Root Vegetables. LOVE THIS SALAD! Made it last night, topped with broiled salmon and it was really satisfying. Awesome leftovers for lunch. I love that the leftovers don’t wilt like salads with regular lettuce. This will be a go-to recipe for lunches and dinners. Thank you!